Custom built 4 stateroom vessel with crew quarters aft. Many well thought through upgrades to ensure comfortable and safe cruising in the Pacific Northwest. 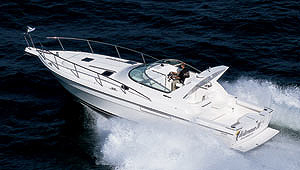 Extensively upgraded over the past year and in beautiful condition. PLEASE CALL TO ARRANGE VIEWING! 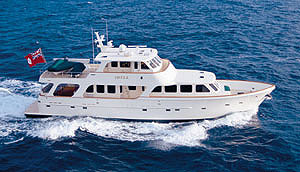 Custom built 4 stateroom vessel with crew quarters aft. Many well thought through upgrades to ensure comfortable and safe cruising in the Pacific Northwest. Well equipped but not "frilly", Trident has the space to allow guests to spread out and the tenders, kayaks and fun equipment to keep everyone entertained. The basic yacht includes bow and stern thrusters, 4 station MMC controls, active stabilizers, enormous battery capacity and charging capability, generator, inverter, diesel hot water heating, vacuflush heads, full electronics, a tender and all the required safety gear. VIP Stateroom - Center mounted queen berth against forward bulkhead. Hanging lockers and drawer storage as well as ensuite head with full shower. Port Guest Cabin - Double on the bottom mounted fore and aft with single above mounted across the beam. Hanging lockers and drawer storage. Starboard Guest Cabin - Double berth cabin with hanging locker and drawer storage. Washer and dryer installed in one of the hanging lockers. Master Stateroom - Full width master stateroom with king size bed along aft bulkhead. Bulkhead finished with mirrored french window in varnished mahogany. Hanging lockers and drawer storage outboard on both sides. Vanity and bedside tables. Full ensuite head with shower in tile and corian counters. Appointments include bronze ship's clock and digital depth sounder. Pilothouse - Up the circular stairway to the pilothouse with two new Stidd helm seats and helm on centerline with navigation table to port. The helm area includes engine instrumentation, electronics and controls for vessel operating systems. Below the nav table are storage lockers including chart drawers. Galley and Dining Area - Aft of the helm to starboard is a U-shaped settee. To port is the galley which includes a full 4 burner propane stove with oven, new stainless steel side by side fridgefreezer with freezer drawer below, microwave, toaster oven, new dishwasher and lots of cutlery, dish, utensil and pantry storage. Galley completely renewed 2011. Main Salon - The galley counter separates the galley from the main salon with sofa and bookcase to port and L-shape sofa, entertainment center to starboard. California Deck - The main salon french door opens to the California deck. There are wing control stations on each side for close quarter maneuvering, a large L-shape settee with table to starboard and teak stairway to the command bridge to port. Aft Cockpit and Swim Grid - Steps down to the aft cockpit which opens onto the swim grid and allows easy boarding to either side or to the dinghy at the stern. Engine Room, Crew Quarters and Utility Room - From the cockpit through a Diamond Sea Glaze bulkhead door and down a few steps to a second bulkhead door that opens to the engine room. The engine room houses the engines, generator, furnace and a wide variety of electrical and plumbing accessories. At the bottom of the stairs on starboard is a crew cabin with twin single berths. To port is a utility room which houses the watermaker, hydraulics and the crew head. A comfortable layout with space to spread out and enjoy cruising. Clearly constructed with an eye toward maintenance and redundancy in systems. A boater's boat, so to speak! Crosley propane stove with oven. Panasonic stainless steel microwave oven. Propane barbeque on command bridge deck. Custom stainless steel countertop with built-in sink with pressurized hot/cold water system and water purifier system. Galley completely renovated in 2010/11 with new appliances, new stainless steel countertop with integral sink, new taps, new drinking water purifier and new storage cupboards. Furuno NavNet GPS/chartplotter with depth sounder. ComNav 2001 autopilot with rudder angle indicator. TackTic windspeed and wind direction. Laptop with Samsung flatscreen monitor with Nobeltec navigation software and GPS feed. Sony audio/visual center with TV on electric lift, CD changer and Trac Vision 4 satellite system. Standard Horizon digital depth sounder in master stateroom. 12 and 24 volt ship service electrical systems with vapour proof master switches and tabulated and fused distribution panels. 2 X 8D (24 volt) starting batteries for each engine. 8 X 8D (24 volt and 12 volt) house service batteries. 65 amp X 24 volt alternator on starboard engine. Second 24 volt alternator on starboard engine. 65 amp X 12 volt alternator on port engine. Promatic 50-3 12 volt battery charger. Promatic 21-3 24 volt battery charger. 2800 watt Magnasine inverter with 125 amp battery charger. 12.5 kw Kohler generator with soundshield. Glendinning cablemaster systems on 1 X 30 amp shore power cord and 1 X 50 amp cord. 130 lb polished stainless steel plow anchor. 230' X 3/8" galvanized anchor chain. Stainless steel bow and perimeter rails. Oversize stainless steel swim grid rails. Stainless steel commmand bridge rails. Teak tread stairs to California deck from aft cockpit and to command bridge. Custom built in 1993 by Canoe Cove with family friendly 4 stateroom layout. Aft sundeck, cockpit, hull extension and TNT swim grid lift by Padden Creek Yachts of Bellingham, WA, in 2005. Beautifully kept and updated by knowledgable owners. 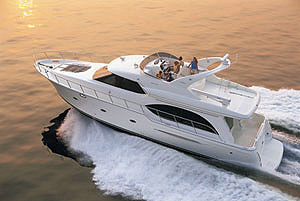 Comfortable, capable, safe and equipped with significant redundancy in systems for northwest cruising. Hydraulic bow and stern thrusters, anchor windlass, fold away dinghy davit and TNT transom lift driven by hydraulic pump mounted on port main engine. System has oil reservoir tank mounted in port aft workroom. Kohler 12.5 kw generator with soundshield. Remote mounted engine oil filters. Dual Racor fuel/water seperators with gauges. 5 X 3500 gph automatic electric bilge pumps. 1 X manual gusher bilge pump. Emergency bilge pumping system on starboard main engine with manifold to control intake from various bilge sections throughout boat. Trolling valve on port main engine. Scotty downrigger mounts with electric power capability. Downrigger and crab pot puller fit into mounts. 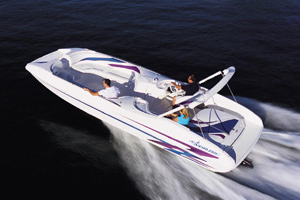 Webasto diesel fired hot water furnace system with outlets and controls throughout boat. Mathers microcommander electronic engine controls with stations at pilothouse helm, command bridge and port and starboard side of California deck. Bow and stern thruster controls at all helm stations. Propane locker in starboard aft coaming of cockpit with 2 X 20 lb tanks, tank selector and regulator. 3 X Pantagraph windscreen wipers with washers. 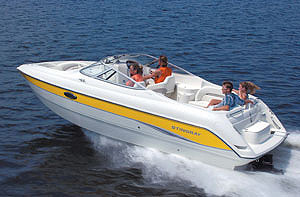 Sea Star hydraulic steering with pilothouse and command bridge steering wheels and autopilot. Aqua Pro SMR rigid hull inflatable with 9.9 hp Yamaha four stroke outboard mounted on command bridge. Launched and retrieved by fold away hydraulic davit. TNT hydraulic dinghy lift/swim grid at transom. 28 gallon outboard motor fuel tank mounted in port aft coaming. Custom high polished stainless steel radar arch. Fiberglass hull with fiberglass longitudinal stringers and plywood bulkheads. Teak decks. Teak and carpet on interior floors. Varnished mahogany interior. Helm engine instrumentation includes: tachometer, temperature, oil pressure, drive oil pressure, volt meter and fuel levels. Command bridge instrumentation includes: tachometer, temperature, oil pressure alarms. Engine room engine instrumentation includes: tachometer, temperature, oil pressure, drive oil pressure and volt meter. ZF marine gears - 2.63:1. 3" stainless steel propeller shafts. Dripless shaft seals and bonding brushes. 2 X 4 blade X 34" propellers. 2 new Stidd helm chairs. New teak and maple floor. New roll screen systems for doors. New custom stainless steel galley counter with integral sink. New taps, new drinking water purification system, new garburetor, new fridge, stove, dishwasher. Command bridge deck resurfaced with non-skid. 3 new pedestal mounted helm seats. New dinghy mounting system for RIB with outboard. New bimini with front windscreen panels. New canvas covers for tender, California deck seating and table, freezer, barbeque, helm chairs and windscreens. New 50 amp electrical service with isolation transformer, electrical panel, shore cord and glendinning cord winder system. Inverter with 14 new AGM batteries. Test and rebuild alternator systems. Propellers and spares sent to US for balancing.